it is well suitable as compressed fluid engine - Air engine or air motor. avec une Quasiturbine QT75SC pneumatique. Pneumatic systems have a big advantage: they are cheap and don't require impractically expensive battery maintenance. the steel types used in natural gas vehicles can store 4 kw-hr of energy. Assuming (conservatively) that 50% can be recovered, we have a real world density of 2kw-hr/40kg = 50 watt hours per kg. only by 100% discharge: something that cuts battery life to only a dozen or so cycles. The power to weight ratio of compressed air systems is quite high: Higher than most electric system. The Korean inventor energine has developed an electric & pneumatic hybrid car. becomes cold due to the adiabatic expansion of the air and loses efficiency. A compressed air motor provides for powerful acceleration while not adding to system weight. so that the car can recharge its air reservoir and its battery and operate separately or together as required. Electric-Petrol Hybrids are complex and expensive and still require exotic materials. The air-petrol (or diesel) hybird may be a cheaper option that overcomes these limitations. costs associated with the more common electric hybrid design. and consultant Michael M. Schechter for more than a year on an air hybrid vehicle design that uses a camless valvetrain. Tai presented the team's findings at the Society of Automotive Engineers World Congress in March 2003.
where stop-and-go traffic leads to a wasteful use of gas. when kinetic energy is converted into heat in the friction brakes. stored and later used to help the vehicle speed up, for instance. but to compress and expand air captured during braking as well. When it is compressed, air can store energy that is neither toxic nor explosive. Once the air is expanded, the burst of energy that is released can be used to help accelerate the car. and have already proven capable of reusing braking energy. by an energy conversion and storage system housed in a black box under the car's hood. stores it as electricity and then releases it when it is needed. which adds weight to the car and drives up costs. Manufacturers are forced to reduce weight in other ways. to compensate for the added weight involved with the electric hybrid approach," said Tsao. "With an air hybrid you don't have to worry about that." but needs only an air storage unit weighing no more than 30 kilograms. the air hybrid model, bottom, is less complex than the electric hybrid model, top. "The air hybrid does not require a second propulsion system," said Tsao. "This approach allows for significant improvements in fuel economy without the added complexity of the electric hybrid model." The UCLA researchers avoid the need for an additional motor by introducing greater functionality into the engine's valve system. in a synchronized fashion to let in air and fuel and to let out exhaust. The camshaft is designed to perform in a predictable and fixed way. The same operation occurs over and over -- nothing more. that allows for more variable valve operation, with greater control over when a valve opens and for how long. Tsao developed methods to precisely control the valve operation over a wide temperature range. This, in turn, makes it possible for the traditional engine to do more than just burn fuel. "We wanted the engine to compress air and charge the compressed air back to the engine," said Tsao. "So we replaced the cam shaft with an electronically-controlled valve system." Tsao's proposed valve system allows the engine to operate in four different modes. When a vehicle decelerates, the engine is used as an air compressor to absorb the braking energy and store it into the air tank. Whenever the vehicle stops, at a red light for example, the engine is shut down. Once the light turns green and the driver touches the accelerator pedal, the engine is started by compressed air. at which point the engine is switched to conventional combustion mode and begins burning fuel. The concept of driving a vehicle with compressed air is not new. In fact, a compact version of an air-powered car was introduced at the Paris Auto Show in late 2002. That car had a four-cylinder piston engine powered only by compressed air that is stored in an on-board air tank. before air hybrid vehicles become widely accepted. "We want to optimize the size of the air storage tank, and begin testing the air hybrid operation using a diesel engine," said Tsao. As consumer demand grows for more environmentally friendly road vehicles, drivers may one day find themselves riding on air. gravity energy storage, human power, etc. Researches are also about to give solutions to future context. There will be room for all sorts of solutions. and talk about the weakness of our underground crude oil parasitic society. Accept that some visionary peoples try even now to oppose menu alternatives to the 300 HP gas piston engines ! Petrol is a net energy source only to those who think it is OK to still pump petrol from the planet underground reserve. Based on long term, petrol products are not energy sources, but energy carriers just like the hydrogen or the synthetic fuel. The difference is only that it stores energy from another era ! to express the efficiency form "well to wheel". and after it has been stolen from the underground (foreign) reserve. is quite convenient compared to a mini synthetic fuel plant ! Many are disappointed that air car promoters do not tell the truth straight and complete. not the solar or windmill fans... Not even probably the Quasiturbine team ? Let others do it! Steal it from others! Let's wait and see! Being too efficient can mean doing little innovation... That's probably the way America is giving up its car industry ? Wait and let the fish hunt : cook it when it becomes larger ! ...But sometimes, others catch the fish, and you are left with little free lunch ? or extremely efficient photo-detonation engine... Quasiturbine win (or lose) on all sides ! of which the energy applications are often the worst non recyclable uses. Remember our fundamental human society problem : We use to much energy and power. Compressing a gas produces both pressure and heat. Excellent reversibility can be achieve if one keeps both the pressure and the heat stored together. to still produce a fairly good reversibility. For short term uses, it may be beneficial to store both the pressure (moderate) and the associated heat. where the pneumatic wagon could be refill every few hours, not to say partly refill from the braking energy recovery. and allow better conditioning the air purity by releasing dry air, which is most suitable to reduce subway moisture. subway gas relaxation could further cool down the ambient air, a great advantage on summer ! which energies add up to quite an excellent reversibility. but it could be of direct interest, like in conditioning the subway air. to the gas during relaxation (almost magic conversion !). while total energy is conserved considering earlier compression. but does not provide a net additional energy output ! But keeping the heat (higher temperature) in an air tank reduces it energy capacity ? which would in fact reduce the local mechanical work done by the same reservoir capacity. then the same mechanical work could be extracted (but with some residual heat lost at exhaust). by those who keep stating that gasoline contains 9000 w-h/liter. one need to have about 2 tons of oxygen ! but our vehicle further steal the air while underway from our atmosphere. Should we oppose petrol unfair results to the alternative energy solutions ! where most vehicle hardly reach 9 % efficiency form fuel to wheel (which is in the range of many interesting alternatives). because of volume reduction and because of temperature increase. and the work done by the compressor on the gas is much less. the heat accumulated at the end of an adiabatic compression. isothermal compression produces worthless low grade heat unfit for any heat recovery. conform to Carnot principle that 2 different temperature sinks (heat flow) are needed to do so ! or adiabatic (assuming no heat lost) are equally highly reversible. which one would you preferred in term of mechanical energy conversion efficiency ? but he also state that for a given delta T, this conversion efficiency decreases with increase of the temperature zone. than higher temperature large delta T of hot steam . and free atmospheric air oxidation, so is the planet loosing. This is what we are all doing by using underground petroleum. Heat pumps are heat movers. he gets a useful artificial over unity efficiency that no one seem to contest! and over unity are motor is unfortunately not possible, notwithstanding the artificial over unity compressor. with an over unity efficiency (?). and cash in the over unity heat pump efficiency ? At most, you get good reversibility, but no gain. Carnot allows over unity heat pumps but takes back all profits later ! but making use of the free heat (trucked cycle) is. all exergy considerations strongly support the development of a multitude of energy alternative technologies. and only a large variety of technologies are going to provide an optimum exergy world ! with stolen underground petroleum and stolen atmospheric oxygen. No one is doing it to sustain SUBs ! Anyway, we will be force to do so soon, so why not now ? ... Who is against planning phasing out and in ? and strongly reverse the nefast adiabatic cooling, providing the air motor can accept this kind of hot air ? when they designed their cycle of turboshaft jet engine ! and the air motor is to inject the fuel into that same air flow and burn it in-situ. with efficiency and power modulation advantages over conventional hot turbines. 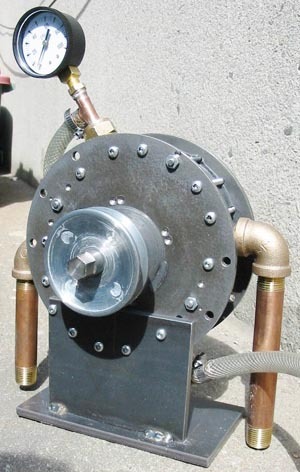 Turbo-shaft jet engine are noting else than large heated air motors carrying their own compressor ! One of the most efficient and high specific power engines of all time ! the average efficiency from gas tank to wheels in actual vehicle use barely reaches 9 % ! A perfect Match (using liquid nitrogen) ! Usable with intake sustained pressure as low as 20 to 50 psi! L'APUQ are doing go-kart Quasiturbine integration work with the Quasiturbine QT75SC pneumatic.